Over the last 5 years or so we have had around 5000 people come and stay with us at Cherry Lakes. Many of these guests have become regulars and as a result a good number of people have become good friends. I have to say we did not really think about the ‘friends’ aspect when we set up Cherry Lakes, probably because I had a combination of my ‘business and (separately) fishing heads’ on. Meeting friendly and often like minded people, particularly if they also love Cherry Lakes, is the most enjoyable part of running Cherry Lakes. It is because we interact with so many people we also see some of our guests experience serious illness and occasionally even death. Indeed hearing how fate can sometimes deal an individual a very poor card ensures Judith and I try to keep our feet firmly grounded and have an attitude of living life to the full….now! It is very obvious to us that this is not a dress rehearsal and you cannot take anything for granted. Paul and Donna Rolfe are a lovely couple who have been visiting Cherry Lakes virtually every year since 2014. We were very much looking forwards to their visit next month. Unfortunately we received some shocking news last week about Paul which put our 100th member of the 30+ club in stark perspective. It was a real surprise last week to get a call from Donna saying that Paul had died unexpectedly and suddenly last week. Needless to say we were both stunned and upset by this news and have expressed both our sorrow and best wishes to Donna. 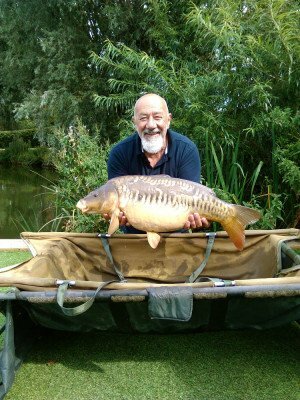 Paul was a lovely, happy and extremely likable gentleman who absolutely loved fishing at Cherry Lakes. It was always a pleasure to spend some time with Paul and see how much he enjoyed his time whilst he was here. The photo below is a typical one of Paul because from my perspective he was always smiling and looked like he enjoyed life. Paul, you will be missed by everyone who knew you. Rest in peace my friend.